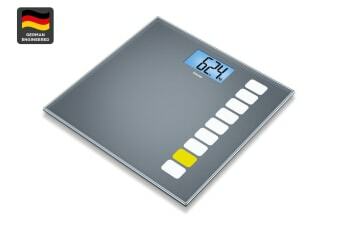 The super slim Beurer Digital Glass Sequence Bathroom Scale is the perfect addition to an ultra-modern bathroom. Featuring exclusive German Design and Engineering the Beurer Digital Glass Sequence Bathroom Scale (GS205) features a generous sized modern platform of Slimline Safety Glass and a large standing surface with extra large easy to read digital display. The scale includes simple tap on technology, 150kg weight capacity, 100g graduation as well as an automatic switch off function. You can also get accurate measurements with the variety of weight modes including kg, lb and stone.